Theme parks. Giant playgrounds designed for adults that can be a huge waste of money, especially in Singapore. We all know the rides in Universal Studios Singapore aren’t exactly worth our bucks, so theme parks are a must-visit for Singaporeans when we go overseas. But forget Disneyland and all the other generic ones – here are 10 unique theme parks in Asia to check out when you’re on your travels! Credit | Now that’s a screamer ride. Dubbed as the theme park with the steepest rollercoaster, Fuji Q is located near the base of Mount Fuji in Japan. The theme park is famous for its Takabisha ride which features a whooping 121-degree drop! Be sure to check out the rest of their ‘screamer’ rides as well if you’re a sucker for 360-degree loops and twists. Since the attraction is located near Mount Fuji, you’ll be able to get a breath-taking view of the famous mountain on a clear day if you’re lucky. The amusement park is a three-hour bus ride from Shinjuku, so plan your time wisely and bring something for entertainment on the bus. This one is for the girls who live and breathe in the cuteness of Hello Kitty and friends. For S$47, immerse yourself in Sanrio Puroland in Tokyo, Japan for a day of adorability. This place is filled with various themed rooms featuring the different Sanrio characters like Gudetama or Melody, and the entire park is a medley of cutesy pastel colours, so Sanrio Puroland is one place to visit especially if your partner is the kind that queues for McDonald’s Hello Kitty toys. But hey, whatever makes her happy right? Japan is on a roll with cool theme parks! If dangerous rides or cute stuff aren’t quite your thing, check out this onsen theme park in Tokyo that opened in 2017 – the entire place is one huge hot spring park. Personally, the biggest draw for me are the games within the park: you get to try your hand at throwing a ninja star! How cool is that? However, do note that Onsen Monogatari does not permit tattooed visitors like most public baths in Japan. Maybe invest in a full coverage waterproof concealer? Surprise! Bali isn’t just about cheap markets and water sports. The Safari and Marine Park allows you to have Breakfast with Lions for around S$65, which… is pretty pricey, but lions! That’s not all. If you opt to stay within the Safari’s lodging for the night, you’ll get to observe the safari animals from within the comfort of your own room. Erm, take my money? Did you grow up with the Powerpuff Girls, Dexter, and Johnny Bravo? Welcome to the Cartoon Network Amazone in Pattaya, Thailand, where you’ll get to meet your childhood superheroes in person. The theme park isn’t just about the cartoon characters: its attractions include a heart-dropping 12-metre free-fall water slide with a 360-degree loop. Now that’s what I’ll be there for! The park also has a miniature floating market, which is great if you didn’t have time to visit the real one in Bangkok. 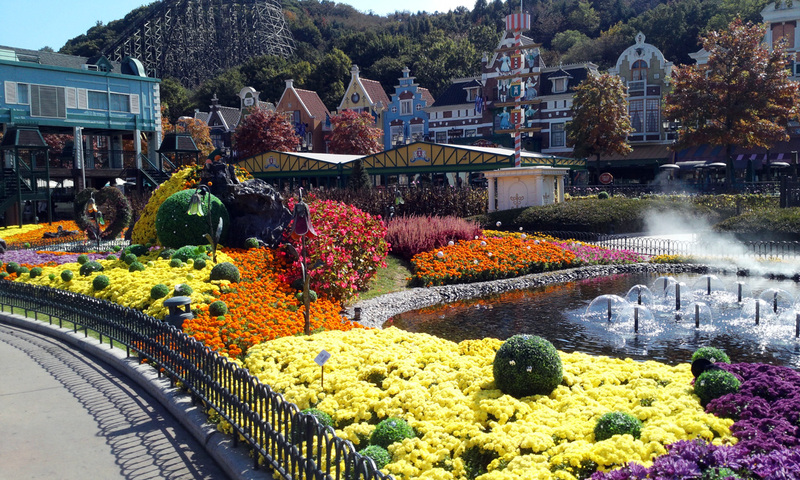 If you’re sick of shopping on your holiday, why not visit Everland in Korea? The theme park was ranked No. 16 in the world for visitor attendance in 2014, and is practically choked with attractions; there’s a rose garden where you can stroll through like a princess, and even a mini safari. This place is like what, an amusement park on steroids? Worth, worth, worth it! Next to Everland is Caribbean Bay, its water park equivalent. Another water park, you ask? Well, this one has a spa room with relaxation capsules at the Spa Village. The Sauna room features five different types of sauna, and if that ain’t your jam, I don’t know what will be. There’s also a surfing zone, so Caribbean Bay is as good as Wavehouse and Wild Wild Wet but wayyy better. Located in Kaohsiung, Taiwan is E-DA World, a theme park based on ancient Greek Mythology and Santorini Island, so you’ll feel like you’re in Greece instead of Taiwan! How’s that for a two-in-one holiday? Aside from an indoor amusement park in the Trojan Castle, E-DA World also has a theatre built to resemble an ancient Greek temple. When you’re hungry, take a relaxing walk at Santorini Mountain City to dine at the restaurants and pretend you’re actually on Santorini Island (your followers won’t be able to tell the difference). If Disneyland makes your wallet cry tears of blood, fret not– Snoopy’s World is Hong Kong’s lesser known mini theme park which is free to enter. Although there is only one ride for children, the park holds a charm of its own with various iconic structures from Snoopy’s World like his doghouse and an old school school bus. Just go and fill your Instagram with pics of your fav characters! Of all these theme parks, Bali Safari and Marine Park is next on my to-go list. There is nothing more surreal than waking up to see zebra and rhinoceros right outside my window, so I’m definitely visiting the park soon. What about you?